Led by Dave and Jane, ten Cache Hikers participated in a night-time excursion to Franklin Basin. 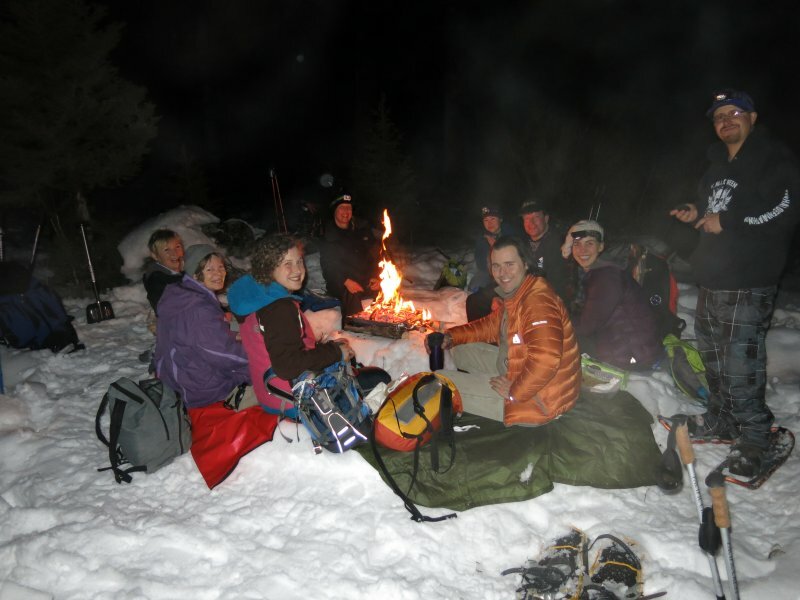 Dave and Monika used cross-country skis, and Alex, Rick, Joe, Jeanne, Jane, Alexi, Stephanie and Anna were on snowshoes. Several others had expressed interest in joining us, probably because the Cache Valley Visitors Bureau featured our trip as part of the Logan Winterfest 2013, but their plans changed and we ended up with only one more person than last year. 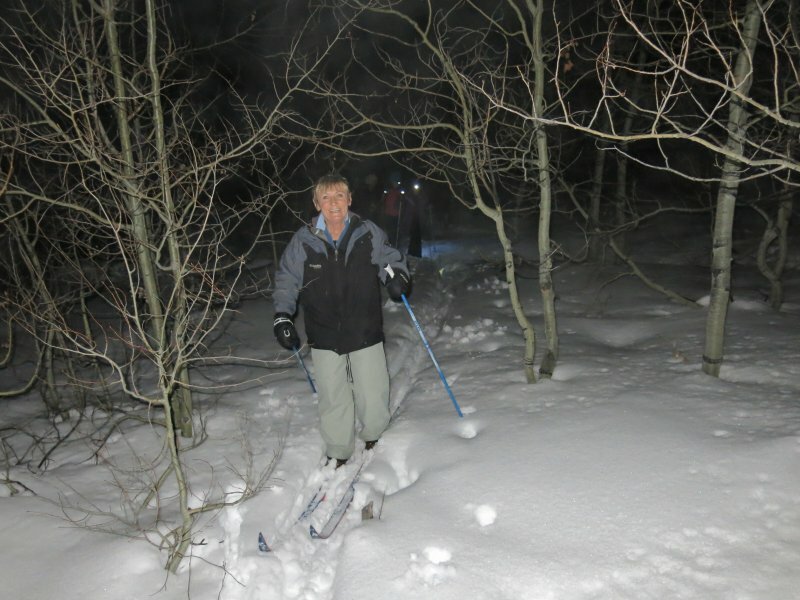 We met at 6:00 p.m. in Logan, but it was after 7:00 by the time we got to the Franklin Basin Winter Trailhead, donned our skis, snowshoes and headlamps, and headed out into the night. 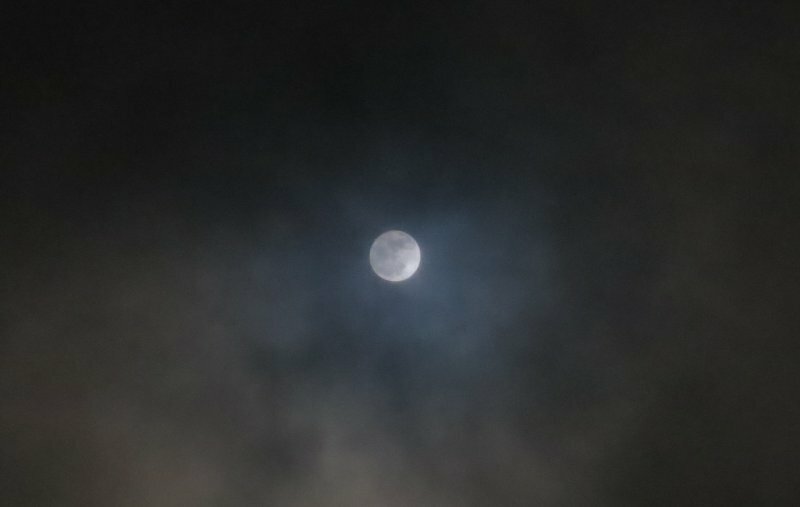 The full moon was not directly visible at first, but a bright spot in the clouds revealed its location and enough light filtered through to make headlight use "optional". We began our trip by following the groomed snowmobile trail, but after 1/4 mile most of us left the trail for a meandering route along the Logan River. After a mile of slow progress through heavy, deep, soft snow, we returned to the groomed trail for easier travel past Steam Mill Canyon, Hells Kitchen Canyon and Beaver Spring. Then we turned east, back off the trail, to our destination near Hansen Hollow. Jane had taken the faster route along the groomed trail, so she was able to make final preparations by the time the rest of the group arrived. We arranged ourselves on a snow bench encircling the cheery fire that Jane had started and shared snacks, including "Moon Pies" that Dave brought along for the occasion. Holes in the clouds provided glimpses of the full moon as we enjoyed pleasant conversation and marveled at the wonder of the night. At 38 degrees F, it was surprisingly warm, especially after weeks of sub-zero and single-digit temperatures in the valley below. Eventually the fire burned down, the ashes and firepan were soaked and bagged, and we headed back out. The groomed trail had just enough downhill slope to facilitate a speedy "kick and glide" for the skiers, but the snowshoers weren't far behind. We arrived back in Logan about 11:30 p.m., a little later than anticipated. The next morning a major snowstorm hit Cache Valley - we would have been forced to cancel our trip if the weather had arrived a half-day sooner.